The H135 (formerly known as the Eurocopter EC135) Is a twin-engine civil helicopter produced by Airbus Helicopters. Development of the (then) EC135 predates the actual formation of Eurocopter. First appearing as the Bo 108 under Messerschmidt-Bölkow-Blohm in the 1970s. The modern iteration as referred to here is the result of a design revision in the 1990s. The model was then renamed the EC135 to coincide with the formation of Eurocopter. The H135 is a very popular with police, emergency services and for executive transport. In 2013 global emergency services alone accounted for over 500 H135s. A bearing-less main rotor, customized engine management software and a lateral air intake allow the H135 five a greater payload and “best-in-class” performance. The H135 has a choice of turboshaft engines. Either a pair of Pratt & Whitney PW206BBS or two Turbomeca Arrius 2B2PLUS units. This gives the helicopter power reserves for single engine flight in case of failure. The H135 is ideal for urban and suburban operation thanks to its Fenestron shrouded tail rotor. Another factor that makes the H135 a popular urban choice is the low level of noise it generated compared to other similar helicopters. Flying over densely populated cities is therefore much less of an issue. The low maintenance costs and long service intervals also make it attractive for cash-strapped police and emergency services. The H135 needs an intermediate inspection every 500 flight hours and periodic inspections every 1000 flight hours, or roughly three years. Overall the H135 has high endurance, is compact and carries more load than other rotorcraft in its category. Apart from this technical robustness, the H135 is quite modern, with its digital flight controls. Crucially, it can operate under instrument flight rules (IFR), further increasing the range of its roles. There are at least twelve known variants of the EC135, including the EC635 and TH-135 military variants. 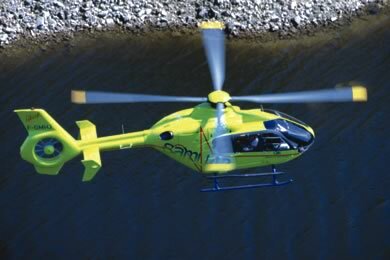 An H135 costs about $4.2 million and approximately 1100 EC135s (the previous designation) have been sold globally. Sixty nations have put it into use and collectively these craft have logged more than 3.25 million flight hours. Do you want to comment the Eurocopter EC135 helicopter?